My earliest travel memories are of road trips my family took to visit my grandparents in Alabama during the holidays. Stopping at a Stuckey’s to buy pecan logs and fruit cake was as much a part of our family holiday tradition as hanging stockings by the fireplace and leaving cookies and carrots out for Santa and his reindeer. Those stops along the journey are as memorable as any other part of the trip. Though most of the Stuckey’s locations have long since closed, travel has remained a big part of my family’s holiday tradition. Whether visiting relatives, or traveling to a warm-weather destination to escape the cold weather (yes, it gets cold in Atlanta, too) the holidays just wouldn’t seem like the holidays without packing our bags and going somewhere. 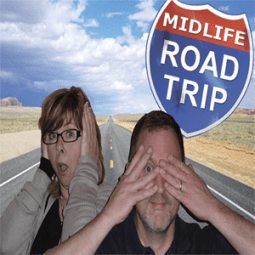 For me holiday travel isn’t always about the destination. It’s about collecting memories. I’ll never forget the time my wife and I were traveling between in-laws and we had our Christmas Eve dinner at a Waffle House in Anniston, Alabama, because it was the only place that was open. We struck up a conversation with the only other customer in the restaurant, a widow in her 60s, who thanked us for talking to her and eating with her as she had no family. Earlier in the day we were frazzled because it was so hectic trying to fit in all the relatives we needed to visit over Christmas. After dinner, we felt blessed to have such a dilemma. I’ll also never forget the time I decided to take my wife and two daughters on a Caribbean cruise over the holidays. Our flight from Atlanta was delayed and it looked like we were going to miss the ship. Fortunately Carnival had a representative waiting for us at baggage claim who helped rush us to the ship. We arrived 15 minutes after the ship’s scheduled departure. We didn’t know whether to be embarrassed or proud as hundreds of passengers on deck for the cast off party cheered us as we ran up the gang plank. But of all of my holiday travels, the most memorable was visiting the Christmas markets in Europe. One year, Viking River Cruises invited us to explore towns along the Danube River from Nuremberg, Germany, to Budapest, Hungary, during the holiday season. The festive lights and decorations of each town and village made us feel like we were in a fairy tale. Singing choirs, handmade crafts, the smell of food, and the taste of warm gluhwein (that’s mulled wine for you novices) helped us capture the Christmas spirit like never before. Experiencing Europe’s Christmas markets, where so many of our Christmas traditions began, is nothing short of magical and is worthy of any Bucket List. Here are some photos from our epic holiday. The Schonbrunn Palace in Vienna makes a for a majestic backdrop for the Christmas markets from late November through the new year. Graban Street is the heart of the Vienna shopping district. The lights and decor of the Baroque buildings are spectacular. We found vendors roasting chestnuts in almost every market we visited. We paid two Euro for a small bag. Neither of us particularly enjoyed them, but at least we can say we had them. This lady is the proprietor of Wurstkuchl, a 500-year-old restaurant in Regensburg, Germany. There’s no better way to experience the Christmas markets than to stroll around with hot brats in a bun and some warm gluhwein. Gingerbread was readily available in every Christmas market we visited. Here are some decorated gingerbread cookies, ready to be eaten or hung on a tree as ornaments. Having grown up in the South, I felt that the sight of outdoor ice skaters was especially Christmasy. Horse-drawn carriage rides in Nuremberg, Germany, are a great way to explore the Old Town district and get into the holiday spirit. Various bands and choirs took the stages at most of the Christmas markets we visited, playing and singing traditional Christmas songs in both German and English. Christmas trees adorned the streets of the charming village of Melk, Austria. Früchtebrot is a traditional bread made with mixed dried fruit and is sold everywhere during the holiday season. Think of it as a lighter fruit cake that tastes better. The food in the Christmas markets is incredible and the pretzels are big enough for two people to share. We were able to witness a gingerbread-making presentation at the shop in Passau, Germany, that is credited with having the oldest gingerbread recipe in the world. The Christmas markets come alive with light at night when the locals are off work and head to the city squares. 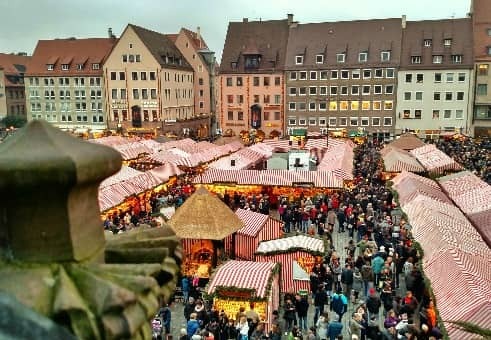 The Christmas markets in Nuremberg, Germany, are among the largest in the world and are not to be missed. We found these cinnamon pastries at the Christmas markets in Budapest. To make them, dough is cooked over flames, then coated with cinnamon, sugar, nuts, and spices. The pastries taste as good as they smell! What has been your most memorable holiday travel experience?